Thursday August 10th 2017 was a real hot day – 28 degrees. It was so hot in Toronto that day, the entire 2017 Search for Miss Teenage Canada congregation headed for Bluffer’s Beach in Scarborough to cool down. We drove past Brimley Beach and stayed the course to Bluffer’s Point which is at the base of Brimley Rd (to the east of the Marina). 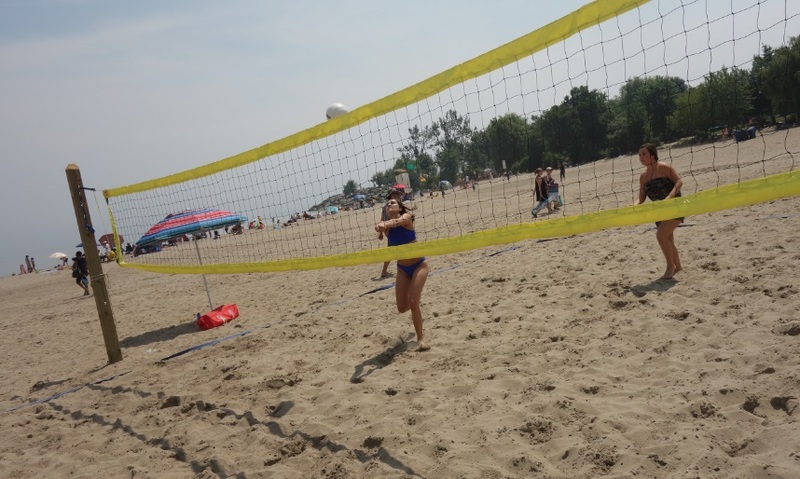 This blazing hot quarter mile of sand offers a spectacular view of the Scarborough Bluffs! Its also has a shady park on it’s west side and overall the place was perfect for us because its so secluded and not as crowded as other big city waterfront attractions. See below, Cynthia Menard, 2017 Miss World Canada at Bluffer’s Beach Park wearing a sponsor’s suit and selecting others for her travel-beach wardrobe. We brought the crowd. As soon as we arrived, everyone was pointing and looking at our assembly in our white silk sashes and crowns. Throughout the day we had strangers offer exotic gifts, and many young people approached to ask our delegates to pose for pictures. And that’s because WE ARE THE ATTRACTION! When we visit these Toronto tourist traps we bring along the crowd, and today we even brought along a couple of sponsors. Bathing Belle Swimwear got images for catalogs and social media channels. Danic Salajko from Bathing Belle Swimwear set up shop and a pop-up change tent under a nearby tree and dispensed beautiful designer pattern bathing suits to willing models as selected by Darren Lee, the camp photographer. His pictures are available; Darren Lee connects on Facebook. Here are this author’s photos of the Bathing Belle swimwear line that was modeled that day in the best shady spot near the beach – just far enough along the shore so you cant see the police boat on left. Snappy Towels was there too. They offered up a ‘Beach Lifestyle Instagram Challenge @SnappyTowels and free towels for six ‘winning’ delegates that included the brand logo (either on the towel or the beach ball) in their shots on this massive social networking platform. The photo of Alexia Antonio at the top of this post is one of these that I found on Instagram afterwards. Walking around we discovered these two sunbathers up on the rocks at the ‘Bluffer’s Point’ landmark. Both are wearing the sponsor’s swimwear, but only one had a Snappy Towel. Dan Wood the CEO of the company was right behind me and quick to supply this delegate, any others who didn’t have a Snappy Towel to dry their hair or cushion their bodies on the beach. Snappy Towels are not like any other swimming towel, shammy (chamois) or gym towel you’ve ever tried. This microfiber towel is strangely soft and feels nice on the skin. Its heavy and durable and the exterior edges have twelve snaps. Here is Miss Teenage Victoria BC Lina modeling a green unit in the nature set near the rocks at Bluffer’s Point, opposite the beach. Snappy Towels are made of a unique textured microfiber that feels similar to a Turkish towel, while possessing all the absorbency and quick-dry capabilities of microfiber fabrics. The edges have plastic snaps which makes the towel uniquely versatile as beach clothing apparel and the units look particularly clever when worn as capes. The company also provided us with six or seven blue and pink vinyl beach balls and there were present at every photo set including Marlon’s movie making endeavours near the picnic table area. So the whole day was spent playing sports and helping sponsors while enjoying the hot sun at the beach. When we got there the sand was so hot.. the ladies who took off their footwear had to hop along the path toward our picnic tables as the hot sand felt like it would burn your feet off. The gals playing volleyball really noticed it and wondered.. maybe that was why nobody else was playing? Below is Miss Teenage Quebec serving up a hot shot on the beach. We made our main camp close to beach, on a trail near a wooden area where there were picnic tables. First thing we did was slaughter the watermelons. 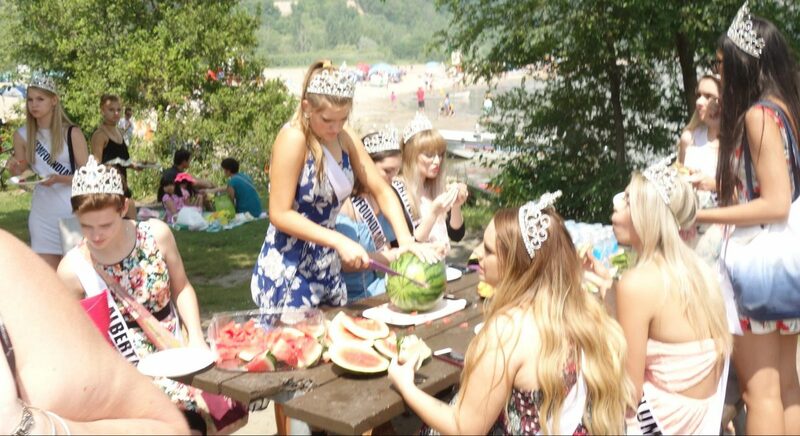 As soon as we arrived we ate watermelon that was cut very efficiently by Miss Teenage Calgary 2017 – Thanks Cailyn. 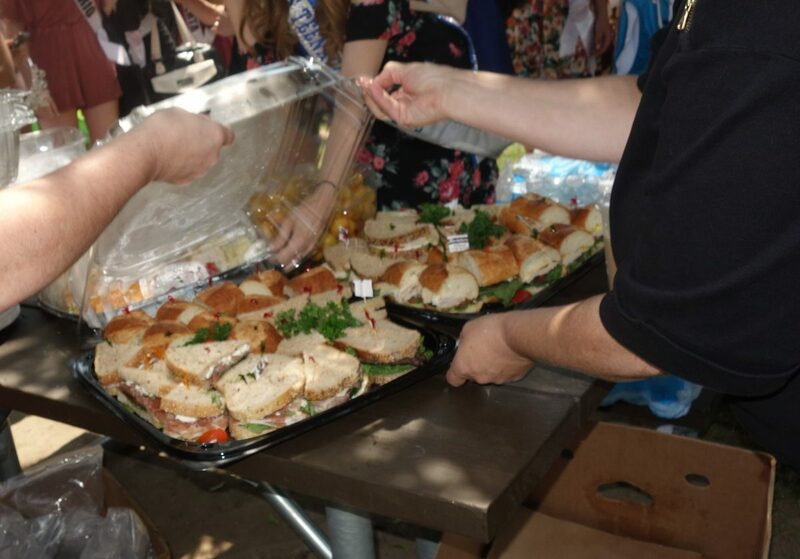 The lunch that day was donated by Marcheleo’s Toronto grocery delivery service and consisted of many healthy sandwiches and salads, including many vegan and gluten free options. It didn’t last long. The meal was devoured minutes after arrival because it was delicious and we were all real hungry. Two huge platters of fresh cut vegetables and dip, and a giant fruit tray filled with chopped fruit and berries accompanied the sandwiches. And four huge watermelons. It was a hot sunny Beach Day that nobody will soon forget. This entry was posted in Events, official blog, Sponsors, Sports, Travel and tagged Bathing Belle Swimwear, Beach Day, Bluffers beach, gluten free sandwiches, gourmet market, grocery delivery, Instagram, Marcheleos, microfiber beach towels, organic marketplace, Snappy Towels, toronto, vegan sandwiches. Bookmark the permalink.